As we age, a big part of happiness depends on being comfortable and cared for at home. Home is where memories have been made, and are still being created. When caring for the home becomes a burden the unwelcome thought of moving strikes. Should you live in a home you’re unhappy with—one that’s getting cluttered and dusty because you can’t do the chores like you used to? Should you learn to cope with eating less because it’s difficult to shop and cook? Should you give up your pet because you can’t care for it? 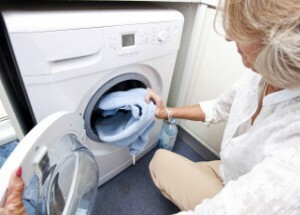 Should you put up with wrinkled or dirty clothes? Should you move away from home? There is another option: Preferred Care at Home’s homemaker care. We make your house into that special place again. We do the chores and provide those tender loving touches that make you comfortable. Ultimately, our homemaker care can help you or a loved one remain where you want to be—home. Let us take care of the mundane day-to-day tasks so you have more energy to focus on what’s important. Elderly parents resistant to other care. If your parent would benefit from personal or companion care but is reluctant to accept it, why not introduce the concept gently through homemaker care? Homemaker care is also included in our signature live-in care service. Our homemaker care includes the following services. If you have questions about Preferred Care at Home’s homemaker care or would like to schedule services for yourself or a loved one, please contact us today to experience the Preferred Care at Home difference. Our compassionate caregivers are available for as little as one hour or as long as you need to ensure your house remains your home.